Inspired by the principles of aromatherapy, this body milk treats skin by leaving it soft and lightly scented. It offers a luxurious sensation of well-being thanks to its unique scent deriving from the element of jasmine. Moisturizing complex consisting of Greek thyme honey and sodium hyaluronate LMW hydrates and nourishes the skin. Honey and beeswax provide moisturizing action leaving the skin soft. Olive oil, almond oil, shea butter and aloe nourish and protect the skin. Vitamin E, provitamin B5 and organic lavender extract by APIVITA FARM enhance the moisturizing and protective effect. 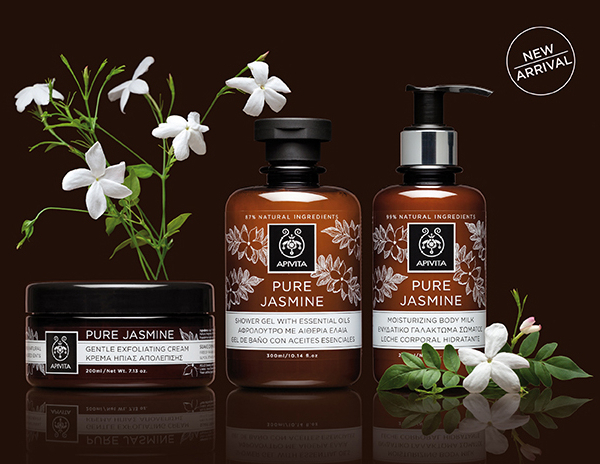 Organic jasmine, neroli and patchouli essential oils give a sensation of well-being and euphoria. Unique feminine jasmine scent combining notes of muguet and tuberose, lilac, rose, orange blossom, green fresh notes, amber and musk. Excellent texture for easy application and quick absorption.